• Excellent reference for modelers and vehicle enthusiasts. A plastic kit is available. From its introduction in 2007, the International Harvester Navistar MaxxPro evolved to meet the demands of U.S. military personnel in defeating the effects of improvised explosive devices on vehicles in the theaters of operation in Iraq and Afghanistan. 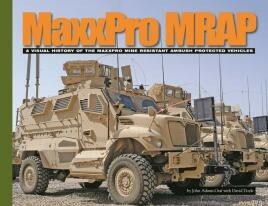 By 2015, nearly 9,000 MaxxPro MRAP variants had been in service with 16 nations in addition to the United States. Based on the sturdy and reliable line of International Harvester commercial trucks, the MaxxPro MRAP variants would grow to encompass the M1224; M1224A1; M1234; M1235 and the massive M1249 wrecker. Noted military vehicle experts John Adams-Graf and David Doyle tackle this subject like never before. Tracing the origins of the MaxxPro from its conception in 2006 and throughout its varied career in all combat theaters, this is a Visual History title like no other. Drawing on official documents and Defense Department imagery every facet of the vehicle's development and deployment are covered. Each of the full-page color photographs is more stunning than the next. Arranged chronologically, the coverage depicts Iraq and Afghanistan zones, as well as training areas and finally the redeployment of the MaxxPro family in the hands of Iraqi and Afghani national troops. This coverage is also supplemented with detailed walk around images of the M1224 and M1249 wrecker. All in all, a title not to be missed by the modern vehicle enthusiast and an indispensable reference for anyone owning the Kinetic or Bronco scale model kits. In one publication you can expect detailed info about several versions of MRAP, which are accompanied with detailed photos. Of course, such reference guide will be a valuable addition to your build project, and I would recommend to get it if you are interested in modern military vehicles. All in all, a title not to be missed by the modern vehicle enthusiast and an indispensable reference for anyone looking to tackle the Kinetic or Bronco 1/35-scale kits. More photo album than history book…complete with comprehensively captioned full-page colour photographs. This is a superbly produced and very interesting book. Not only are the photographs clear and sharp, but the information they and the notes provided will prove very useful to the modeller to get even the smallest detail correct on their model.